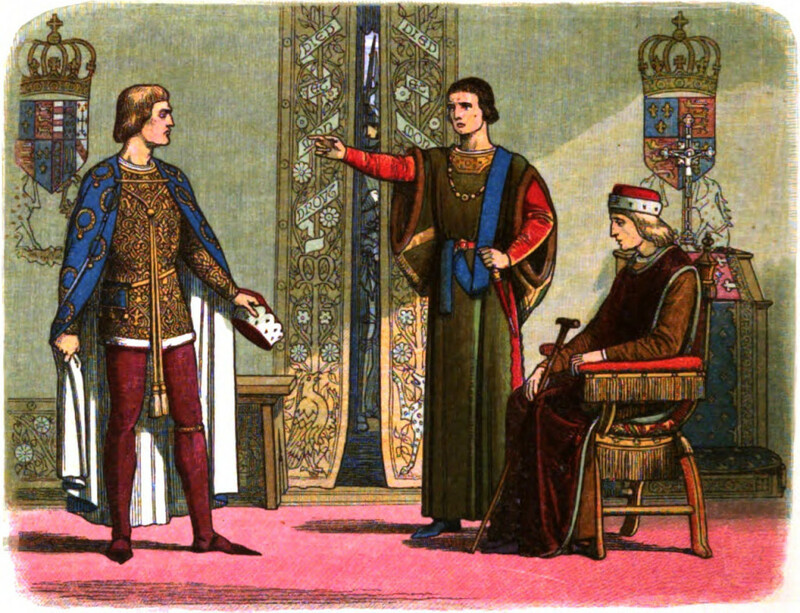 Henry VI sits while Richard Plantagenet, 3rd Duke of York, and Edmund Beaufort, 2nd Duke of Somerset, have an argument. 1864. Public Domain. The late 15th century was a turbulent era in English history. The crown forcibly changed hands five times in 30 years. This series of violent conflicts has come to be called the Wars of the Roses. Shakespeare dramatized the period in plays such as Henry VI and Richard III. Recently, it has inspired works of both historical fiction and fantasy, including the HBO series “Game of Thrones.” In a new book, historian Dan Jones revisits the true events of the time. He argues that our understanding of the period is largely an invention of the Tudors, whose reign began at the end of the century. The real story, he says, holds important lessons about leadership and how history is created. Dan Jones Historian and author. Penguin Group (USA) LLC, A Penguin Random House Company. Copyright © Dan Jones, 2015. MS. DIANE REHMThanks for joining us. I'm Diane Rehm. In the bestselling book, "The Plantagenets," historian Dan Jones transported readers to the Middle Ages. He told the story of the kings and queens of England's longest ruling family. In his new book, Jones returns to medieval England to trace the fall of the dynasty. It came at the hands of two branches of the family, the Yorks and the Lancasters and their feud over the royal bloodline. MS. DIANE REHMThe title of his book is "The War Of The Roses: The Fall of the Plantagenets and the Rise of the Tudors." Dan Jones joins me in the studio. You are invited, as always to be part of the program. Give us a call at 800-433-8850. Send us an email to drshow@wamu.org. Follow us on Facebook or Twitter. Dan Jones, it's good to see you again. MR. DAN JONESIt's a pleasure to be back with you. REHMThank you. I must say I'm gonna let the cat out of the bag. Dan Jones just said to me that this book so far is your very favorite. Why is that? JONESI think it's to do with the feeling I got when I was writing it. You just have this sense that the words are flowing, the story has this beautiful kind of narrative shape. I was really, really enjoying the research so I was doing a lot of work in the archives looking at old documents, at the chronicles, the legal records of the time and just this -- it was ending story. The last book, "The Plantagenets," set up this book, you know. JONESWe got to this cliffhanger in 1399 with the deposition of Richard II and I was kind of itching to get to the end of the story, you know. It's sort of -- it was like the break halfway through the play. You want to see the denouement of what's about to happen and that's what "Wars of the Roses" is. REHMAnd, you know, roses makes it sound as though it's sort of a soft kind of happening. In fact, it's filled with blood and gore. JONESIt's a thorny book if you want the rose metaphor. But was really interesting to me when I got into this subject was how much of this idea of the Wars of the Roses is really much later than the events that we're describing. So much of it comes from the Tudor period and the time -- and from Shakespeare, of course, and from the time when it was in the interests of the new ruling family, the Tudors, to portray this war or these wars of the 15th century in very simple dynastic terms, one side against the other. REHMSo why is it called the Wars of the Roses? JONESWell, that image comes from the 16th century, in fact from the late 15th century, after the battles really had been fought. The House of York on one side had used a white rose as its symbol. It also had other symbols, the falcon, fetlock, the sun in splendor. We're accustomed to thinking the Lancasters used a red rose, but they didn't. This wasn't really a Lancastrian symbol. It was created as such after the event by the Tudors in order to create, from the two roses, a third, the Tudor rose, white petals, red petals, joined together so that whenever you looked at that image -- it's like a modern branding sign. JONESYou get the Tudor version, the Wars of the Roses, the family fell out. We reunited them. But it wasn't quite like that. REHMAnd you say the interpretation we got was the wrong one. JONESWell, we're so accustomed to thinking about it, partly because of Shakespeare. And if you think of Henry VI, Part I, that rose bush scene when the nobles are standing around plucking roses to show their allegiance to either side, by Shakespeare's time -- he wasn't trying to rewrite history. By Shakespeare's time, this was just how people thought about the wars of the 15th century, but it wasn't the case at all. JONESWhat's interesting is that name, the Wars of the Roses, every time we say it, we're perpetuating the myth. We're thinking about this in really simple, stark, dynastic terms, one side against the other. Well, the reality was the sides shifted and changed, allegiances changed, people flipped sides. The wars were caused for different reasons, sometimes dynastic, sometimes political, sometimes it was just sheer chaos. JONESSo what I've tried to do in the book is to show how much more complex this period was than, let's say, Shakespeare's version of it. REHMSo what you're saying is that modern historians have come to see this as far more complex than they had originally thought. JONESHistory is always about getting under the myth and starting to look past, you know, popular conceptions and, yeah, the more historians look at this period, I think the more they see there were lots and lots of different angles, different aspects, different factors in this war that can't really just be accounted for by thinking about it in simple terms of two sides. On the other hand, in historical fiction, I mean, I'm sure everyone listening will have seen "The White Queen" or "Game of Thrones" or whatever. JONESWe still are attached to this idea of a family split and fighting between itself because it's a very seductive and enjoyable dramatic kind of conceit. REHMHave you watched "Game of Thrones"? JONESHave I ever. I love "Game of Thrones" -- I love "Game of Thrones." JONESEvery historian I know loves "Game of Thrones." JONESBecause here's what's great about "Game of Thrones" that you don't get from many other historical series. "Game of Thrones" takes, as its jumping off point, the Wars of the Roses, but it doesn't pretend to be the Wars of the Roses. About 18 months ago, I spoke to the guys who run the show, David Benioff and Dan Weiss, and they explained. They said, we don’t try and mimic history. The jumping off point is the Wars of the Roses, but then the freedom is there to throw in story lines from Cleopatra. JONESThat's the Daenerys storyline, has elements of that. Stories from Scottish history, the Red Wedding, that's a excerpt from Scottish history. The Lannister armor and costume is influence by Japanese samurai armor. So what you do with "Game of Thrones," what George Martin and the TV team has done is take the Wars of the Roses, throw in a load of other history, chuck some dragons in, some white walkers, some fantasy, stir it all up and you create an alternative medieval universe but that's of itself. JONESSo as a historian, what you don't do is sit there going, oh, it wasn’t really like that, I know it was different, which I do with "The Tudors" and with "The Bourgeois" and whatever. So and I'm aware that makes me a bad person to be sitting there doing that, but I think "Game of Thrones" because it's in its on world, you're just free to enjoy it. REHMAll right. Give us a brief outline of how these Wars of the Roses began. JONESSo 1420 looks like the high point of England in the Middle Ages. It's -- Henry V has just won the battle of Agincourt and secured the Treaty of Troyes by which he claims the French crown as well as the English. There's peace at home. Everyone thinks Henry V is the new Alexander. This is the high point. However, two years later, Henry V dies and he leaves as his heir a nine-month-old baby. REHMAnd who is making the decisions for this nine-month-old? JONESSo around this nine-month-old are lots of nobles of the royal blood, his uncles. So you might say, well, hang on, why don't the Wars of the Roses break out in the 1420s then? They didn't break out for 30 years because the nobles around this baby pulled together to manage England as best they can while the kind is a child. But they run into a problem. The king grows up and he never -- but he never really grows up. JONESHe's effectively very childlike, innocent and naive throughout his adult life. It becomes obvious that he can't keep peace at home. He's incapable of stopping feuds between his barons. He can't fight. For sure, they never even bother to send him to France where there's a huge war going on at the head of an army because he's totally incapable and he has no interest. He's a very pious, gentle, innocent, naive sort of person. JONESWe have these accounts of him. He wouldn't swear. The worst swear word he would say is forsooth and forsooth. And I know you think that everyone walked about in the Middle Ages saying forsooth and forsooth, but there was worse language used. Henry VI would go -- so he's a very innocent person, the worst possible candidate for a king, couldn't fight, couldn't keep order, fundamentally so tensions start to build up. JONESAnd then, 1453, there's a dramatic loss for the English, the Battle of Castillon, which is basically the loss of the whole Plantagenet Empire is now complete to France. And Henry VI goes mad. Not mad with rage, mad as a form of catatonia, total shutdown, can't eat, can't recognize anybody, can't speak, can't do anything. And the tensions that have built up under his reign to this point boil over and a factional dispute breaks out between his cousin, a relative, Richard, Duke of York on one hand and the queen, Queen Margaret of Anjou and her allies, the Dukes of Somerset on the other. JONESAnd this spills over into a series of battles, political control. That rolls, by 1460, into Richard, Duke of York, the king's cousin, deciding that he has to do something drastic 'cause he's backed into a corner. He's just lost a very important battle. So instead of trying to be the king's chief counselor, he says, I should be the king and that's when the problems really start because then you open up a series of dynastic battles, huge, huge, huge battles culminating in the Battle of Towton in 1461 where 28,000 men are said to have died on a single day. JONES28,000 men. When Bishop Neville wrote his account to another bishop over in Flanders, he was so distressed at the horror of this battle, the bloodiest ever fought on English soil, that he wrote in his letter, Alas, we're a race deserving of pity, even from the French. And you know it's bad when a bishop's saying that. REHMBut here's what I'd like to understand. From the time this infant child, nine months old, begins to grow into adulthood, I mean, are there people really taking orders from him or are they creating the orders a claiming that they're coming from this infant, boy, young man? JONESIt's really interesting the way they do it because when the child is a baby, you'd think the baby would just be sent off to sort of grow up with his mother, with his little household, and, in effect, he is, but you come -- you have a difficult situation because the child is -- they pretend the child is a king so when an active king, when they have to transfer his seal from one official to another, they pass it through his tiny baby hands. REHMLet's finish that story after a short break. Stay with us. REHMHistorian Dan Jones is with me. His brand-new book "The Wars of the Roses: The Fall of the Plantagenets and the Rise of the Tudors." Here's a post from "The Diane Rehm Show" website from Tish, who says, I love the new generation of historians who write history so it flows and is interesting. I love Dan Jones and his books. "The Plantagenets" was fantastic. So far, "The Hollow Crown: Wars of the Roses" has been such an amazing book. It's hard to put down. How nice. JONESThat's very flattering. But it's a point that's important because when I was growing up there a lot of history books that I read, let's be frank, were dull, were boring, were not that engaging. JONESWhat a disservice you're doing so the whole of human experience if you can't make the stories come alive. We're it, but it seemed to me that history's origins are very different from that. History should be right from Herodotus, okay, back in ancient times through to the great historians of the 19th century. History is about great research, being on top of all the material and all the sources to historical decision-making, but it should be written like a story. It should be written so you want to turn the next page. JONES...because the books are better written. REHMLet's talk again about that young infant at age nine months, made king on through. How do they keep up this pretense? JONESSo there is a great pretense that the baby is king and that's sort of essential to keep the structure of kingship, the structure of political society going. So you pretend that this tiny baby, Henry VI, is completely capable in some way. So he's brought to Parliament even, and have to delay the opening of Parliament because the baby is crying in his mother's lap and having a tantrum and won't calm. But they persist because this is how society is organized. The problems really come when the king gets a little bit older. And that's when it becomes more of a problem if you've got a king who's between the ages of about 12 and 15, 16, 17. JONESWhen he's able to make decisions and be consulted and have his own thoughts and say, but as an adult, so he's susceptible to advice and influence and from favoring certain counselors over others. That's always the dangerous time for a king. On the other hand, what I find with Henry VI is he never really gets past that stage. He remains sort of infantilized most his life and very easily swayed by the last person he's spoken to. REHMWhat about his mother? What kind of role does she play? JONESWell, Catherine de Valois, the mother of Henry VI, is a fascinating character and a great character in the story I’m trying to tell in this book, because I’m trying to twine together the Wars of the Roses with the rise of the Tudor family. Now, Catherine de Valois at the start of our story is married to Henry V, the great warrior. But, of course, Henry V dies, as we've just explained. Who does she marry next? Well, she stays in England but she marries someone extraordinary, her Welsh servant Owen Tudor, who's just a kind of mid-ranking guy from North Wales. JONESI've been up to his house on Anglesey which is as far from Westminster, from London as you can get, really, an island of North Wales. But she marries this servant illegally. REHMWasn't there outrage that she did so? JONESThere was some disquiet because, at this time, Welsh people had no legal status, no legal rights. There'd been a big Welsh rebellion at the beginning of the 15th century, and Welshman just didn't have the same rights as Englishmen, and let alone the right to marry queen. But what Catherine de Valois did brilliantly, brilliantly was play this sort of the French kind of ingénue and say, Oh, I didn't realize, you know. Is that how things work in England? Anyway, she marries Owen Tudor and they have a clutch of children. Two of whom, Edmund and Jasper Tudor, and Edmund will go on to have a son called Henry Tudor, who becomes very important towards the end of the story. JONESBut at the beginning of the story, this is just a sort of weird Welch, French sort of off-shoot of the royal family. Everyone is a little bit sort of embarrassed by or confused by and wants to tuck away and keep out of sight. REHMSo how much of the chaos with France that began to develop, do you lay at the feet of this young king and his inability to govern? JONESI suppose there are -- you can't lay the blame for the French chaos, let's say, in 1429 when Joan of Arc comes along. You can't lay that at Henry VI's door because at that time he's less than 10 years old. However you get to the stage where he's nearing adulthood and what is desperately, desperately needed in France is strong, decisive leadership, one strategy, one will, a king to go over and lead the armies. And it's about morale as much as anything else. JONESBut Henry VI is completely incapable of doing that or being sent to do that. And what develops in the absence of a king is a series of poisonous rivalries between the great nobles of England, and particularly between Richard, Duke of York and Edmund Beaufort, Duke of Somerset. And their personal rivalry, their personal vendetta will roll and roll in the rivalry between the York family and the Somersets, eventually becomes what amounts to a blood feud, is all developed in hostility that builds up between them when their rival commanders in France blame each other for mistakes, resenting each other for losing bits of France. JONESI mean, all of this would normally be solved by a king who had the ability to just bang their heads together and say, This is what we're doing and you need to sort this out. But there is not that, there's not that person there. REHMHere is a tweet from Keith, Can you please have your guests speculate on why so many people went to flight and die for a royal feud? What are their options? REHM...considering what is happening now. JONESConsidering what's happening now but, of course, could be because the test of masculinity and manhood, essentially in the Middle Ages, is your ability to fight. Where's today, I would argue, that we sort of section off our military from the rest of society. And it's kind of binary, you're military or you're not. In this age, men fight. That's what they do. What we also have in England at this time is the remnants of the feudal system. So great lords have relations with knights below them, with villagers below that level, which is to be based on land tenure. But by this stage it becomes a system of cash payments. JONESSo you have essentially lots of lords with private armies whom they pay, and who wear their badges and who wear their livery, the clothes presenting which team they're on, if you like. And so, when the lord has to go to war, he sends out the people he pays to go fight with them. Let's not forget, they are also mercenaries, Welsh mercenaries, mercenaries from the continent. There's a battle in 1487, the Battle of Stoke where a lot of Swiss mercenaries come over to fight in England. JONESThere are lots of soldiers of fortune and soldiers for hire. And there are a lot of soldiers coming back from English-held France, which is progressively being re-conquered. So you have returning soldiers with nothing to do, who only know how to fight. So you've got a very highly charged militaristic society in this period. There's no shortage of fighters. REHMWhat about the ordinary people? How are they affected, the non-the military citizenry? Do they have enough food? Is the money going all to the military? How do they survive? JONESI think, like any time, there were good periods and bad periods. There are bad periods that have nothing to do with the wars. Let's take 1480 when flu comes to England for the first time, outbreak of influenza, a terrible sort of disease that at this stage and killed people. So there are factors way apart from the wars which make everyday life miserable, just as they do in many parts of the world today. There are periods of war where if you lived in the midlands or if you lived in the borders of England and Wales, or if you lived in the north of England, you would experience a great deal more disruption. JONESArmies marching through, purveyance where people come up to your village and say we need your crops, we need your animals, we need your carts, we're taking them, king says. There are also probably periods -- parts of England where everyone, where you might not even know the battles are going on in life would just progress as it always did, good times and bad times, lean times and better times. JONESWell, London in the 15th century, in fact, London throughout the Middle Ages is, in fact, London today. It is a very different place from the rest of the United Kingdom, from the rest of England in this stage. It always seems to be tense. There's always the possibility of violence. There are a lot of people living on top of one another. There are several episodes, which I've described in the book, where noble tensions come together in London and you have Cade's Rebellion in 1450 where there's a battle fought on London Bridge. They try and set parts of the bridge on fire. JONESSo the battle, with the smoke in the bridge and people fighting on the bridge, and falling off and drowning in the river below. So London, but London, on the other hand, is the center of pageantry. So whenever there's been a great victory there'll be a sort of, they'll clean London up and they'll put nice sand down on the streets. And there'll be a sort of wonderful procession through town. So London, like everywhere else, has its violent, dark times. And it's kind of times of great splendor and glory, as well. REHMSo, some of these Hollywood scenic extravaganzas really play on those images. JONESWell, in the Middle Ages, spectacle is everything. So a new king, if we look at the end of the story, when Henry VII has become crowned king after Bosworth. The first thing he does is go up to York which was the hometown of his enemy, Richard III, Richard, Duke of Gloucester. And there's incredible pageant held there because Henry's married Elizabeth of York, you know, a princess from the other side. And as they processed into York, there's this enormous mechanical devise with a red rose on one side and a white rose on the other. JONESAnd, you know, out of these come figures representing Henry and Elizabeth. And then, and more flowers behind them twined together. And this is, because this is public relations in this period. It is not the case that you can come on the radio show and tell people what the story is. REHMWhat the real story is. JONESIt's about visual spectacle. But there's the other, the darker side of that visual spectacle, of course, is that how do you deal with your enemies? There are lots of violent beheadings, lots of much darker episodes of public spectacle, as well. REHMWhat about the women? And you say, while they couldn't hold official positions, they really played or had tons of influence behind the scenes. JONESWell, Diane, the one thing I enjoyed so much, I said that at the beginning I enjoyed writing this book the most. And one of the reasons is when I'd finish writing "Plantagenets," the book that came before this, I kind of -- I was very proud of the book. I was very happy with it. But I kind of felt like a bit man heavy. You know, it's a lot of guys on horseback with swords bashing each other on the heads. What you get with "The Wars of the Roses," look, you can't choose your cast of characters, as a historian. What we're fortunate to have in "The Wars of the Roses" is there's immense cast of characters of strongman, strong women. REHMHow long did she live? JONES...who's executed by Henry VIII in 1541. JONESFor two reasons, she's on the wrong side of the religious divide but she's also a reminder of The Wars of the Roses because she's the daughter of George, Duke of Clarence. And she's a cousin of Henry VIII on the wrong side. And she's executed at the age of 67 in the Tower of London. But she's so old that the French and the Imperial ambassadors think she's 80 or 90. She's got lovely -- nice, lovely clothes. She's got new slippers. She's got, you know, she's very well dressed and well turned out because she's a cousin of the king. However she's hacked to death in the Tower of London by deputy ax man who takes eight blows to kill her. REHMAnd you're listening to "The Diane Rehm Show." Wow, that sounds pretty grim. Going to open the phones, hear what listeners have to ask for, 800-433-8850. And we should say "The Hollow Crown" is the title of the book in Britain. Different title here in the U.S., "The Wars of the Roses: The Fall of the Plantagenets and the Rise of the Tudors." Let's go to Terry in Wimauma, Fl. Hi, you're on the air. TERRYHi, thank you for taking my call. TERRYI'd like to ask your guest what are his thoughts on, on what happened to the princes in the Tower. Who killed them? JONESHi, Terry. That's a very good question. In fact, is probably the big question of the whole Wars of the Roses. The question was Richard III responsible for the death of his nephew, Edward V whom he'd deposed, and his brother Richard, Duke of York who were prisoners as children, prisoners in the Tower of London. And I suppose the responsible historical answer is we don't know. We've discovered Richard III's skeleton. That didn't tell us. There are some bones in Westminster that are supposedly of the prince in the Tower, we don't know. But they won't tell us. JONESUnless we find the smoking pillow or whatever, you know, they were smothered with, sorry to mix my metaphors, we're not going to know. However my feeling is that Richard III was probably responsible. I know there are other theories that Margaret Beaufort or the Duke of Buckingham may have been. But the theory that seems soundest and most likely to me is Richard III. However I do stress that we probably will never know for certain. REHMHow old were they when they died? JONESTwelve and 10 when they disappeared. That was the last that we see -- so their servants were paid off in July of 1483. The last they were seen for sure was the end of September, playing with little bows and arrows in the gardens of the Tower. And after that, says a chronicler of the time, they were seen no more. That's as much as we know. REHMDoes that answer it, Terry? REHMAll right, thanks for calling. You know, I mean it really is so disgusting that all of this is done in the name of holding on to your place, your throne, your power. And yet you see it all through history, nothing new back then that we don't see even now. Short break here and when we come back, more of your calls, your comments for Dan Jones on his new book, "The War of the Roses." Stay with us. REHMAnd welcome back. Dan Jones is my guest. He is the author of the international bestseller, "The Plantagenets." Now, he got so excited about what he was doing there that when he finished that book, he was bound and determined to move on so he's written "The Wars of the Roses: The Fall of the Plantagents and the Rise of the Tudors." REHMHere's an email from Raj, who says, "Napoleon is quoted as saying that history is written by the victor. How does a history scholar cut through the bias of old historical records, especially when those records are 500 years old?" REHMBut didn't you find conflicting narratives, both of which you put some credence into? JONESOf course. And the other job of the historian and the job of the good journalist as well is to say, here's what we don't know. That's just as important as saying, here's what we do know. So with the previous caller, Terry, when we're talking about Richard III, I think it's really important for us to not get into this -- we know Richard killed the prince in the tower. No, we know he was such a great man. He believed in justice and social security, you know. JONESThat's how Richard III divides people. And I always say that's unhistorical. You've got to admit what you don't know and what the limits of the knowledge are because otherwise, you've strayed out of history and you're into fiction. REHMAnd, of course, there are many historians who'd like to do tests on various bones and skeletons that have been found, but what? JONESWell, Richard III's skeleton which was found two years ago beneath the parking lot in Lester was subjected to lots of tests, DNA testing. They inspected his teeth. They found out what diseases he had. You know, they looked at the plaque on his teeth. There are some people who consider that undignified and something that shouldn't be done to any skeleton, let alone the skeleton of a king. JONESOr who cares if it's a skeleton of a king, but any skeleton. And there are, for example, the bones of the princes in the tower or are they not the princes in the tower. They're held in the little -- in Westminster. But Westminster and, I think, the crown won't allow any tests to be carried on them. I suppose it would be possible to carry out DNA tests. JONESNow, it used to be the case in England, back in the Victorian age, back in the 18th century, we'd pull these skeletons out and have a dig around and, you know, do all sorts of things to them. They've opened pretty much every royal tomb going between the 18th and the 19th centuries. But our attitudes now have changed and there's a much greater reverence for the dead. REHMWould you, as a historian, be in favor of testing those boys' skeletons. JONESEverybody I've spoken to about this says straightaway, straight off the bat, yep, yep, yep. Test them because we're naturally inquisitive people and the sense that there's potential knowledge that we're not allowed to get our hands on, drives a historian mad. REHMExactly. All right. Let's go to George here in Washington D.C. Hi, you're on the air. GEORGEHi. Thanks for taking my call. GEORGESimilar to the email that just came in, but from a different angle. So Dan mentions that great history writing requires great storytelling so how do you strike the balance between telling a great story and historical accuracy and then to continue that thought, as it relates to historical fiction, how do we avoid, as a culture, that this historical fiction, for future generations, becomes the general accepted history? JONESThanks, George. Both very interesting questions about the nature of history and I suppose what I -- I'm always conscious of trying to strike this balance between telling a good story and making sure that we're not getting carried away with the story. So you have to put -- always be checking yourself when you're writing narratives, saying, hang on. We know that the Battle of Towton, that it was freezing and it was snowing and that we can say that this would've been the conditions on Towton field at this time. JONESCan we say, the Duke of Somerset was rubbing his hands together because he was freezing? No, we can't. So this is -- the job of the historian is to make those decisions and that is your position because you're the one sifting the evidence and telling the stories. As regards to your question about historical fiction, I know exactly what you're saying. It's so interesting with the Wars of the Roses that the dominant narrative about the Wars of the Roses is that created by or rather crystallized by, immortalized by Shakespeare? JONESEight plays about the 15th century and that version of the 15th century is still what we go back to and still what most people think of. JONESIt's what sticks. And so that really is why I'm trying to write history like -- in a fashion that will appeal to people who like historical fiction because them you're going to get all the thrills of reading, all the enjoyment of reading good literature, but you're getting the truth as well so -- and that's what's so important for historians. REHMHow much did Shakespeare get wrong? JONESIt totally depends from play to play. Shakespeare's primary overriding concern was writing good drama. In some cases, that coincides very neatly with the facts. Let's take the wonderful scene, a quote from this scene at the beginning of "The Wars of the Roses," this book. Richard II is locked in the Tower of London and he's being kicked off the throne and he's complaining. He's complaining. He says, for God's sake, let us sit upon the ground and tell sad stories of the death of kings, how some have been deposed, some slain in war, some, you know, and he goes on and on and on. JONESAnd he says, within the hollow crown keeps death his court. Now, actually, what we know about that scene is that Richard II really did sit in the Tower of London. He really did -- as Adam of Usk, who went to visit him, he really did discourse dolefully, as Adam of Usk, who was at the dinner with him said. He did really hold forth about how England had done all these dreadful things to her kings over the years. JONESSo Shakespeare, in my favorite passage of the whole of Richard II, is being absolutely true, even if he's versified it, absolutely true to the history. But it's coincidence because Shakespeare's interest is really in the drama and if it coincides with history, great. If it doesn't, well, it's the same technique as any Hollywood movie maker will say. REHMInteresting. All right. To Okemos, Michigan, Bari, you're on the air. BARIHi. I just wanted to share a little anecdote with you. BARII was on a train going from London to Manchester, this was back in the '60s. We went first class for fun. And in those days, when you did, they gave you a little table with a meal and a glass of wine. And sitting across from us was this very nice gentleman and he raised his glass and said, to the Duke of Lancaster. And I was absolutely floored and I thought, he wasn't challenging, but he would not have been pleased if I'd raised my glass and counter toasted to the Duke of York. JONESWhat an amazing story. Look, these rivalries live on. They live on in sports. They live on in intertown rivalries in the North of England. Lancaster, New York, is still one of the most ancient enmities in British society, I suppose. That’s a great story. REHMAll right. And to Brad in Johnson City, Texas. Hi, you're on the air. BRADHi. Thanks for taking my call, Diane. BRADI just wanted to ask Dan, I was excited to hear your interest in "Game of Thrones." As a young historian major, I really enjoyed "The White Queen" and I was always curious about Henry's wife and whether or not her portrayal as a mystic of sorts if there's any truth to that. I'll hang up and listen. JONESThanks, Brad. So we're talking about one of the big storylines in "The White Queen," which is the dramatization of Phillipa Gregory's novels about the Wars of the Roses in which alchemy plays a big part. And what we know historically is that in the 15th century, alchemy was very popular. Lots of people were dabbling in it and one of the accusations you could always level against a woman whom you wanted to do down or do away with for political reasons was that of witchcraft or that of alchemy. JONESWe know -- I mean, as Elizabeth of York, I'm not sure the evidence really stands it up. On the other hand, we look back at Humphrey, Duke of Gloucester's who very probably was dabbling in witchcraft, dabbling in sorcery, trying to predict the future and see whether she and her husband Humphrey would ever become king, if little Henry VI, his nephew, were to die. And she was brought down partly because of her sort of meddling with alchemy, which, by the way, was taking part in conjunction with academics from the University of Oxford because this was a time when science and what we'd now call pseudo science, spiritualism, alchemy, magic, whatever were much closer together than they are today. REHMInteresting. Here's another question about "The White Queen." "How accurately does the Starz series "The White Queen," portray the conflict between the Yorks and the Lancasters. Was Margaret of Anjou as unpopular in reality as she's portrayed in the show? What about her son with Henry? Why was there no support for him as heir?" JONESI suppose what we should say about "The White Queen" is -- well, firstly, we should say it's a brilliant piece of work and the novels and the TV show have really brought people into this period of history in a way I was talking before. I'm a huge fan of historical fiction because it brings people to history. No question about that. As for Margaret of Anjou, her sort of general popularity was not universal. JONESI've got a scene in my book where we describe a man who was hanged and actually cut down. He was supposed to be hang, drawn and quartered, but he was save at the last minute because he'd been muttering in the tavern that Margaret of Anjou was no good. She was never going to produce an heir, you know. So we know there was a level of unpopularity, but only in so far as there's a level of sort of contempt for most public figures in most periods of history. JONESWith regard to her son, Edward, well, look, if the Battle of Tewkesbury had gone a different way in 1471, Prince Edward looked like a very, very good candidate to become king because he was quite the opposite of his father, Henry VI, who I was talking about earlier, who was meek and mild and innocent and eventually mad. Prince Edward from the accounts that we have was vigorous, strong, loved nothing more than charging around with his buddies kind of hitting them over the head with his sword, you know. JONESHe was the sort of -- he was more like his grandfather, Henry V. This was the sort of guy that you wanted as king of England. Unfortunately, the Battle of Tewkesbury went the wrong way and Prince Edward was killed and that was the end of that so we'll never know. REHMLet's follow that with a call from Brian in Dallas, Texas. Hi, you're on the air. BRIANThank you for taking my call. BRIANOne of the things that fascinates me about history is asking questions like what would've happened if Chamberlain and others hadn't appeased Hitler or if George Bush hadn't invaded Iraq. And so my question to Mr. Brown is whether he's given thought to or can identify a seminal event during the War of the Roses which, if it hadn't happened, might've changed the result and English history. REHMAnd before you respond, let me just say you're listening to "The Diane Rehm Show." JONESBrian, I love playing counterfactual games. I think most historians do. What would've happened if or what would've happened if such and such had not happened. There is a really good example of this in the Wars of the Roses. What would've happened had Edward IV lived another five years. JONESAt the age of 40, having lived a very sort of lush life. He got very fat and kind of barrel-chested and surrounded himself by good living and women, okay. Good way to die, if you ask me. But anyway, what would've happened had he been a little more temperate and lived another five years and his son, Edward V had ascended to the throne at the age of 17 or 18, which was the age that Edward IV took the throne, which was the age the Henry VIII eventually took the throne, which was the cusp of manhood and a good age to be taking the throne? JONESI think we wouldn't be talking about the Wars of the Roses. We would be talking about a short period of battles in the 1460s and 1470s, which had just changed the ruling family from Henry VI had been knocked off and the House of York had taken the throne and this would've carried on because we wouldn't have had the Tudors because there would've been no Richard III usurping the throne. There would've been no Henry -- Battle of Bosworth. There'd have been Henry Tudor. There'd have been no need to sell the 15th century as a big battle between two sides of the family that was unified by the Tudors. JONESSo there would be no phrase, the Wars of the Roses. I probably wouldn’t be sitting in this studio now. So actually, when we come to it, I'm pretty glad Edward IV drank and surrounded himself by women because here we are talking about it. REHMBut now, you have to keep on thinking in the sense, what do we learn about leadership from this era? What do we learn about lessons of conflict? How, in this era of conflict, does your book somehow echo? JONESI suppose the great lesson of the Wars of the Roses, if it's to be applied today, is this is what happens when central authority collapses through a lack of strong, decisive, confident, self-confident leadership. And you see a country start to first try to hold together, but then to splinter and for different groups to start feuding with each other. These feuds to gain a critical mass and eventually to end up with more or less a form of anarchy. JONESAs the U.S. and the UK and our allies, as we pull out of Afghanistan, I wonder what we're leaving behind there. Certainly, central authority that probably doesn't extend very far outside Kabul, regional authority which will be more or less operated by warlords who can exert the most power and who will eventually feud with one another, a failed realm that will take generations to fix. That was certainly the case with England. JONESIn the 15th century, I see quite a few parallels in Afghanistan today. What can we say? Well, at least in England, it did get fixed and within generations, strong leadership did reemerge and this was sewn back together. REHMJust fascinating. Dan Jones, thank you for being here. JONESIt's been such a pleasure always. REHMThe book, "The War of the Roses: The Fall of the Plantagenets and the Rise of the Tudors." Thanks, all, for listening. I'm Diane Rehm.